Beaches and scenic beauties along with temple runs are more than enough to add a blissful experience to your journey. Collect spiritual energies to transform your soul. Take a note of lessons and principles of Swami Vivekanand and Mahatma Gandhi at Vivekanand rock and Gandhi memorial. Appreciate the architecture and divine beauty of age old temples. Entertain yourself with the cultural dances and music a treat to all your senses. The industry, galleries, museums & metro life of Chennai. The biggest industrial and commercial centre in southern India and often regarded as the “Detroit of India” for the growth and expansion of the automobile industry, Chennai is the fifth largest city and almost the most populous metro politan city in the whole of India. Chennai houses a number of art galleries and museums apart from the already existing other institutions, most of which are free of any entrance charges. These museums and galleries attract a lot of tourism and voyages into the city. Seaport significance & ecstatic temples of Mahabalipuram. Also known as Mamallapuram, Mahabalipuram is an old historic town situated in the Kancheepuram district of Tamilnadu in South India. 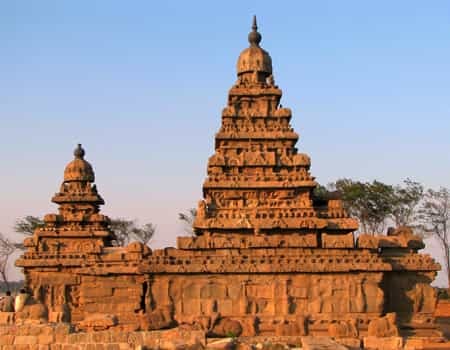 It was an extremely important seaport during the first century and Indian traders who went to other countries south east Asia started their sail from the port of Mahabalipuram. The monuments of this town depict a dravidian and buddhist touch with the monolithic and rock-cut feature. Varaha cave temple and the shore temple are two of the major temples in this town. 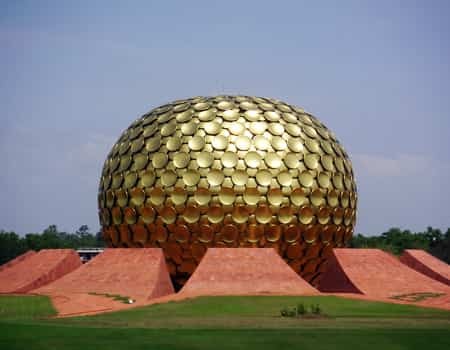 Pondicherry is a district in the union territory of Puducherry in South India. The tourism factor prevails in this town due to the churches, temples, buildings & statues which have been blended with the systematic town planning and French style avenues to preserve the colonial rule in a fashionable way. Promenade beach is a must visit place in Pondicherry surrounding the children’s park, the gandhi statue, the French war memorial & the picturesque nineteenth century Whitehouse. 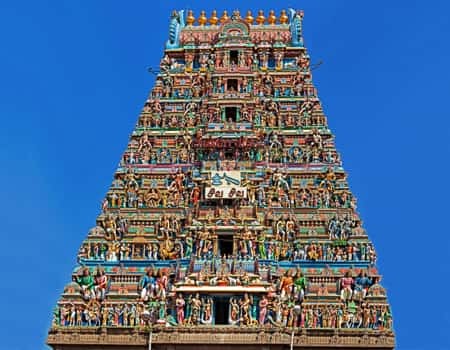 Located 200 miles south of Chennai, Trichy, also called Tiruchirapalli stands right at the centre of the geographical location of the state of Tamilnadu. Trichy temples have also been constructed in the dravidian style of architecture. 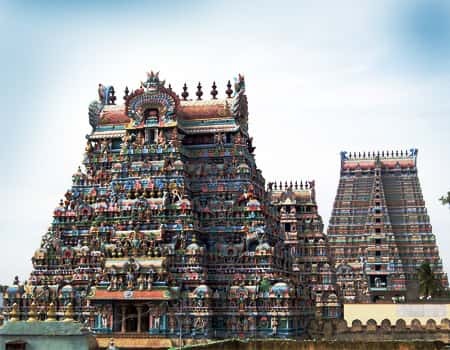 Some of the most famous temples of Trichy include the rockfort temples, the ranganathaswamy temples at srirangam, the Jambukeswarar Temple at Thiruvanaikkaval & the ukrakaliamann temple in tennur. Situated on the banks of the river Vaigai, Madurai is a major city in Tamilnadu and also one of the oldest continuously inhabitated cities of India. Madurai plays a significant growth in industrial development and houses important industries like rubber, cement, automobile etc. Famous for its historical monuments & sculptures, Madurai is able to induce a high number of tourists from across the globe. 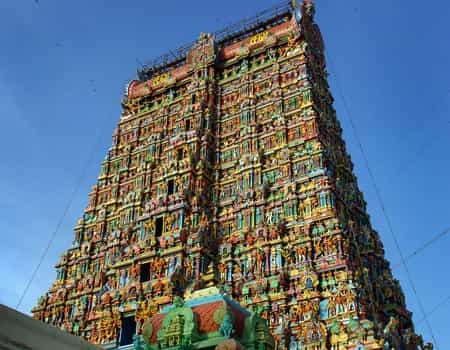 Two more prominent temples being Meenakshi amman temple & tirumalai nayak palace. 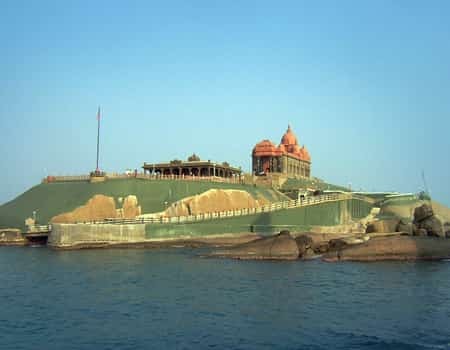 The southern most tip of the entire sub-continent, Kanyakumari, also known as cape Comorin is an important tourist destination owing to the presence of historically important monuments, memorials and other sculptures. The kumari amman and the kanyakumari temple located on the shore of this city is regarded as a “shakti peetha” dedication to the manifestation of Parvati. You may also visit the vivekananda rock memorial and the gandhi memorial. The perfect time to stop over at this small beach town aligned with the Arabian sea a little away from the city centre in Trivandrum is during the sunset time when the waves start to speed up and the imagery is worth a peek. 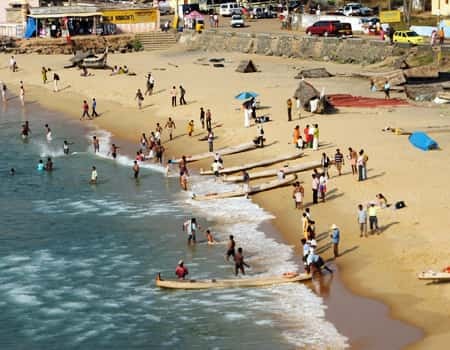 This 17 km long beach is perfectly sub-divided into three parts to seggregate the activities of fishermen from that of the foreigners and locals. The three parts are the lighthouse beach, the hawa beach and the samudra beach mainly consisting of the fishermen’s trading activities. Varkala is the only place in the entire state of Kerala where cliffs are typically found at the ends of Arabian sea. This is a unique contrast to the otherwise extremely flat Kerala. Varkala is a suburban coastal town located 30 miles north-west of Trivandrum. 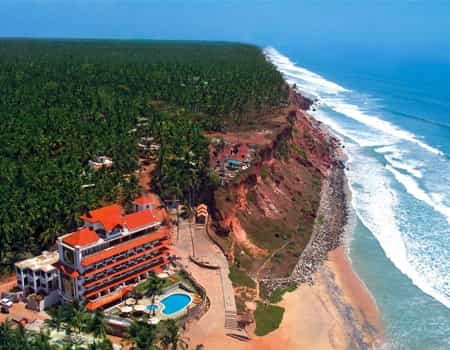 This town is mostly famous for its beaches, the most important being the Varkala beach which was earlier famous for vavu beli (a hindu custom) and the Tiruvambadi beach one km from the Varkala beach. 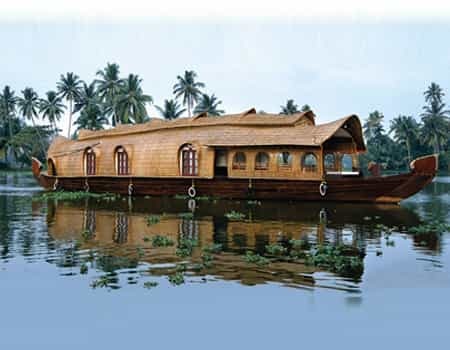 Alleppey, also known as Alappuzha, is famous as a tourist destination for the houseboat cruise experience in the Alleppey backwaters connecting Kumarakom and cochin to the north and Quilon to the south. Apart from this, the Alleppey beach is complimented by the beautiful temples including Ambalapuzzha sri krishna temple, arthunjal basilica, mannarasala temple, chettikulangara devi temple & haripad subhramaniya swamy temple. 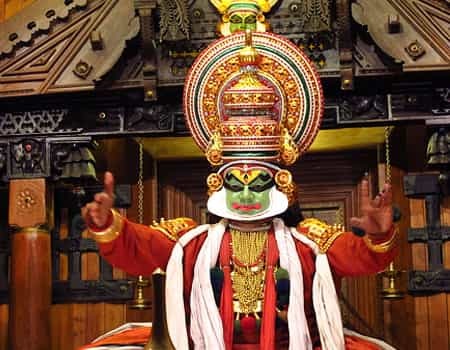 Also acknowledged as the queen of the Arabian sea, Kochi or cochin is the second largest city in the state of Kerala and forms part of an extended metropolitan region. Kochi takes its place as a famous tourist destination due to the breath taking backwaters, the mind boggling promenade of marinde drive, the historically significant Kochi fort and the various palaces including the hill palace and the Mattancherry Palace. The Goan kokum, the beach & shacks, the lite beer. 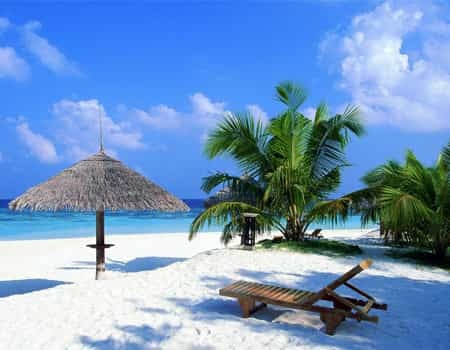 Located in the west India region of konkan bound by Maharashtra towards the north, Goa is the favorite when it comes to foreign tourists and even local tourists. 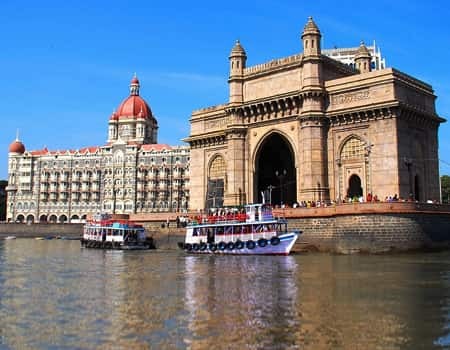 The beaches, churches, nightlife, temples, scenic beauty, restaurants and shacks of this glorious city play an integral part in making this city a most wanted tourist spot. Sipping on a beer while taking a walk down the radius of vagator beach followed by hogging onto fresh smoked prawns is what you would call the perfect evening in Goa. The heritage seeker inside you would take you to the gateway of India, the Taj Mahal hotel in colaba, nariman point & the rajabai clock tower in south bombay whereas the funloving & relief seeking part of you would prefer a nice walk down the queen’s necklace at marine drive accompanied by a steaming cup of on-the-cycle-sold coffee eventually followed by a comfortable dinner at new yorkers or cream center right opposite the Arabian sea. Our India Tour packages score an average of 4.25 out of 5 based on 51 reviews in the last year. This is our second visit to India and we were extremely happy with the attention of LIH travel representatives all the time the drivers were punctual, neat and clean cars, great selections of Hotels. This time we came back to India with an image of doing a spiritual visit to South India which was a nice decision to know India in a better way. We wanted to end our tour in a leisurely way so Goa was undoubtly a great selection. Thanks to the team who has organized our India travel in such a way. A deep thanks to LIH who has made our holidays so well planed covering Chennai, Pondicherry, Cochin, Kovalam, Goa and the Commercial capital of India Mumbai. The itinerary planed runs smooth and on time the domestic flights arrival – departures keeps us on time. I thank our driver David who always remains on toes to assist us for needs regarding the selection of Restaurants, going to ATM etc. Visit to the Koyambedu vegetable & flower markets in Chennai. Light and sound Show in Madurai.